The SLB-200 used ebony in several locations on the instrument such as the fingerboard, reverse style tailpiece, and upper nut. We also changed the saddle material from ABS to ebony, which has had a positive influence on tone. We’ve used ebony in several locations on the instrument such as the fingerboard, reverse style tailpiece, and upper nut. We also changed the saddle material from ABS to ebony, which has had a positive influence on tone. A new preamp and control section has been designed to deliver superior sound quality. The unit incorporates a passive direct switch that allows direct output of the piezo signal to external equipment. This lets you tap directly into the pure, focused tone of the instrument to send its output to the amp. 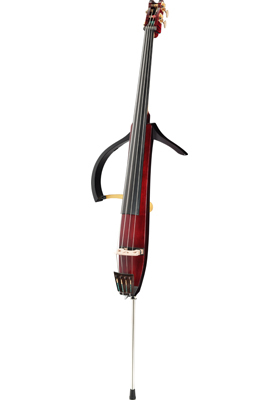 Redesigning the structure and volume of the instrument’s hollow cavity has reduced the instrument’s weight while delivering greater wood bass tone. Using this design along with the pickup system, the SLB200LTD delivers a more natural acoustic tone that is powerfully rich and expressive whether played pizzicato or with a bow. Fine tuning the bridge’s size and thickness gives the SLB200LTD a tone with a quicker response that is clear and well balanced over the instruments entire range. Height adjusters, redesigned with new materials and finish, deliver a purer, more focused tone. In redesigning our tuners, even changing the way they are manufactured, we’ve created a thicker blade that feels solid in the hand. Using a higher gear ratio delivers delicate and precise adjustment while the gold finish adds a luxurious touch of class. Crafted from beautifully figured curly maple, the neck on the SLB200LTD feels extremely comfortable and inviting to play, providing an intimate connection between the player and the instrument. Upright bassists demand stability while playing so we’ve designed a new endpin rubber cap that is thicker, better shaped, and stronger. Using a removable frame that folds up plus additional size reduction through the use of special tailpiece and endpin designs, the SLB200LTD its into a compact case that makes transport easy. ​The SLB200LTD features an Antique Brown finish that brings out the beauty of the wood’s grain giving it a rich and impressive look. The neck has an oil finish that provides the right amount of smoothness and stability that provide a level of comfort and playability that bassists look for in an instrument. On stage it looks great, standing out underneath the stage lights with its professional look and details.